Quenton Nelson knows how important the Chicago Bears offensive line coach has been to his development. Quenton Nelson is not only viewed as the best offensive lineman in the 2018 NFL Draft, some believe he may be the most talented prospect in the entire country. Nelson developed rapidly at the University of Notre Dame after joining the team in 2014 and admits he had a lot of help along the way. Harry Hiestand was his offensive line coach throughout his time at the university and he credits the veteran coach for making him into the player he is today. "He's the one that made me into the player I am," Nelson said at Notre Dame's pro day on Thursday, via the Chicago Tribune's Brad Biggs. Hiestand left Notre Dame this offseason and rejoined the Chicago Bears as their offensive line coach under head coach Matt Nagy, a position Hiestand previously held in Chicago. The veteran offensive line coach followed former offensive coordinator Ron Turner to the Bears in 2005 and held the offensive line coach position until the 2009 season. During that stretch he helped the offensive line become one of the team's strengths, backed by the play of Olin Kreutz and Ruben Brown on the interior of the line. After his five-year stint in Chicago he coached at the University of Tennessee before joining Notre Dame's coaching staff in 2012. During his time as an offensive line coach he has seen a long list of his collegiate players make major impacts in the NFL. Notre Dame's Ronnie Stanley and Zack Martin and Tennessee's Ja'Waun James were all first-round picks after working with Hiestand. Kreutz went to five straight Pro Bowls and Brown went to one Pro Bowl while playing for Hiestand in Chicago. David Diehl, who played under Hiestand at Illinois, was also a Pro Bowler in the NFL. Nelson could be an option for the Bears in the first round with the eighth overall pick, assuming he lasts that long. Recruited out of Red Bank, New Jersey as part of the Class of 2014, 247Sports listed Nelson as a four-star recruit with a 0.9707 composite score. He ranked 61st nationally, fifth at the offensive tackle position and second in the state of New Jersey. He received 30 offers from the likes of Alabama, Michigan State, Miami and Ohio State before formally committing to Notre Dame. Throughout the courting process he was recruited by Hiestand. Nelson capped off his impressive final season at Notre Dame by being named a Unanimous All-American. He has drawn comparisons to Larry Allen by NFL.com and it is hard to find a lot of negatives in his game. An absolute mauler at the guard position, Nelson is also extremely athletic and is more than capable of getting to the second-level. He has the size and frame (6'5" and 329 pounds) to play tackle at the NFL level but he is the most polished at guard. "Quenton Nelson hasn't had any meetings with the Bears," tweeted The Athletic's Kevin Fishbain. "Joked that Harry Hiestand has known him since he was an "immature" freshman." 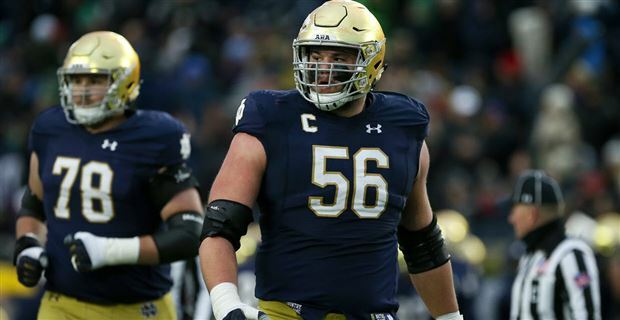 If Nelson is still available when the Bears make their selection with the eighth overall pick, it would not come as a surprise if he is the guy for the Bears considering their needs along the offensive line.